Formerly a Special Education school teacher Rick has also owned his own travel business, and has worked professionally as a musician and a compere. Rick has a keen interest in encouraging and promoting all kinds of music appreciation and performance. Richard Harris (or Rick as he is known) was formerly a Special Education school teacher until 1985 when he opened his own travel business in Lane Cove. He has worked profesionaly as a musician, as a solo performer and in several bands. Rick has lived in Longueville for over 40 years and has one daughter, Katrina, a sucessful performer and teacher of piano and singing. 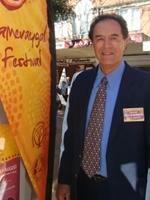 He is also an experienced compere and has been involved in many cultural activities in Lane Cove. Rick brings to the committee his a wealth of experience in teaching and business, as well as a keen interest in encouraging and promoting all kinds of music appreciation and performance.